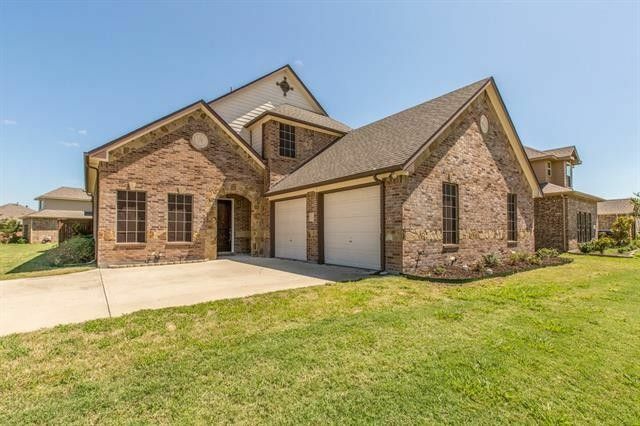 Custom open floor plan with tons of upgrades on .3 acre corner lot. Family Room showcases a stone gas log fireplace. Kitchen includes stainless appliances and sunny Breakfast Nook. Downstairs Master features a private patio and luxurious bath with a jetted tub, dual sinks and tiled shower. Wrought iron staircase leads to the 2nd Master Suite, 2 secondary bedrooms with walk-in closets that share a nicely appointed bath and Game Room with built-ins. Fresh Paint, Convenient Powder Bath, Crown Molding, Lots of Storage, Gutters, Sprinkler System and much more! Oversized garage was designed for boat storage. Hidden Creek offers a clubhouse, community pools, tennis courts, sand-volleyball and catch & release ponds. Directions: I-30 to Royse City, North on FM-548 (Elm), Right on SH-66 (Main), Left on FM-1777 (Bulldog), Left on Hidden Creek into community, Left on Fair Oaks, Right on Northwood, First Home on Left.